German tuner turns SL roadster in a road-going motor yacht. 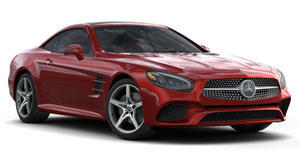 The Mercedes-Benz SL is the default choice for those with the means and the desire for a luxury roadster. But there will always be those looking for that extra touch. Fortunately for them there is no shortage of aftermarket firms that will gladly retrofit a client&apos;s SL. Most focus on performance upgrades, but Graf Weckerle is all about the luxury. The German tuner is known for its intricate customization, turning its attention this time to a yachting-inspired take on the benchmark Benz convertible. Highlighting the extent of what it can do with a luxury automobile, the SL from the Kahrlsruhe-based customizer&apos;s Collection Sport features a series of upgrades. Custom-machined forged alloys finished in white enamel with chrome detailing measure 20 inches across and are fitted with low-profile rubber and to a lowered suspension. Inside the open cockpit is decked out in custom blue leather with contrasting white piping and top-stitching, while the emblems are crafted from white gold. An ECU remap and stainless steel exhaust are available to upgrade the six-cylinder SL350 or the eight-cylinder SL500, with enhancements for the SL63 AMG and SL65 AMG set to follow in short order.